This is a long overdue review of a new chopping board developed by Peta UK. I was sent the board to look at back in August and thanks to haring around after my toddler, work projects and a spell of ill health I've only just got around to reviewing it. Regular readers will remember that I'm quite fond of Peta UK - their equipment so far has always actually worked rather than being gimmicky or flimsy (I'm looking at you masterclass chopper...). So, how did I get on with their board? 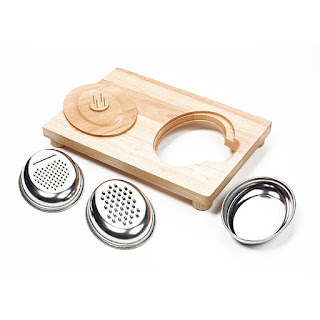 Designed to help people with weak hand function or those who can only use one hand well, the Food Prep Board is wooden chopping board with extra features intended to make it easier to slice, grate and prepare food. Peta UK have spent 10 years designing and finessing the board and it shows - it's a stylish, solid piece of kit suitable for any keen cook.The board has a removable wooden oval section that you can flip over to skewer food on wooden spikes making it possible to use a knife with two hands and cut more securely. You can also take out the oval section of the board and slide in one of the two graters (one coarse and one fine with a slicing attachment) or a stainless steel bowl to collect your chopped food or waste in. This video shows exactly how it works. Yet again, I'm really impressed by a piece of Peta UK kit. I've been having a bad flare recently and my wrists and elbows have been very sore so the board Multi Function Food Prep Board has been a real help. The graters and slicer are nice and sharp making it easy to shred vegetables or cheese. It took me a little while to get the hang of grating horizontally comfortably but once I found a position that worked for me then it was straightforward. The skewered section is brilliant at holding most things steady - I found it particularly good for using on halved onions although I nearly skewered myself attempting to use it on a carrot as pictured on the box. Possibly my carrots were too wiggly! If you do want to chop something very hard using the skewered section, like a butternut squash, then I'd recommend giving it a quick zap in the microwave first to soften it (pierce the skin a few times and cook it on medium for 2-3 minutes). The board is relatively easy to clean. I love that you can put the graters and stainless steel bowl in the dishwasher. I personally wouldn't want to prepare meat on it because it is a little tricky to get the whole thing in the sink to scrub well. The board itself is quite heavy and difficult to store vertically as the wooden section tends to pop out (although on mine it does fit in tightly one way around and flops out the other way which is handy but probably not part of the design :)).This means I think it would be best for people with the worktop space to store it out on display but that is no hardship as it looks beautiful and could easily be used as a pan rest etc as well as a chopping board. 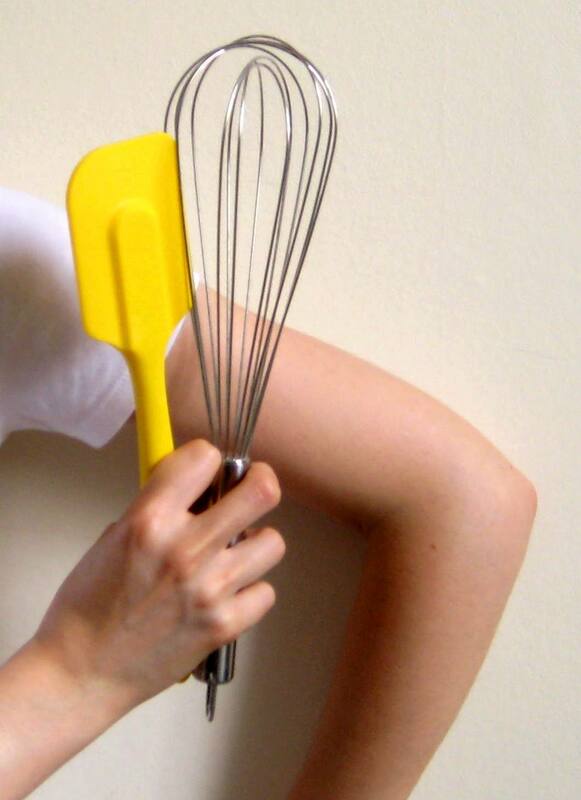 A stylish and helpful tool for anyone who has weak grip or problems using both hands when preparing food. At £65 it is certainly an investment but I can imagine it lasting many, many years. Maybe one for the Christmas list? You can buy the board direct from Peta UK here. 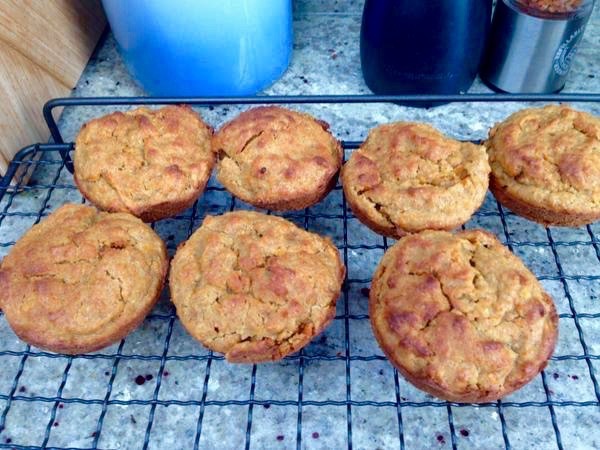 Here's a recipe I wrote for the lovely PsAZZ support group's newsletter - you can read about this great bunch of psoriatic arthritis-ers here. Having people you can share triumphs and tribulations with is hugely important if you suffer from any chronic illness so do look them up and see if you can support them in any way. Don’t be put off by the long list of ingredients for the salad, it’s extremely quick to make and also travels well for pack lunches. Black rice is incredibly high in antioxidants thanks to the phytochemical anthocyanin which makes it that rich dark burgundy-black colour. Anthocyanin is the same plant pigment that makes blueberries blue and blackberries black. Studies suggest that it may help reduce inflammation and even protect against cardiovascular disease but there isn’t enough evidence yet to say how much anthocyanin we need to eat and how effectively it is absorbed by the body. Black rice is also an excellent source of fibre as unlike white rice it hasn’t been hulled. Fibre is great for your body if you suffer from psoriatic arthritis as it helps keep your bowel healthy and keep your blood sugar levels stable. 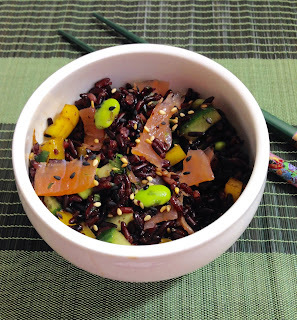 You can find black rice in most supermarkets now but you could use brown rice if it’s not available. Salmon is also an excellent lunchtime choice. It’s a rich source of omega 3 fatty acids which have been shown to help reduce pain and inflammation in all types of arthritis. If you can afford it, buy wild salmon over farmed as it has a much higher ratio of healthy omega 3 fats to unhealthy omega 6 fats. If you don’t like or can’t find frozen soybeans (although Birdseye sell them now), you can use frozen peas. I prefer soybeans as not only are they more authentic, but they are also little nutritional powerhouses. Soy beans are rich in protein, fibre, B vitamins and are a good source of omega 3 fats. They are also packed with isoflavones which some research suggests have anti-inflammatory properties. For those of you with bad hands or who find chopping difficult, I make a very quick, no-chop version of this on flare days that uses tender stem broccoli and fine french beans in place of the cucumber and peppers. Just throw them in the pan with the rice for the last 5 minutes of cooking time. I also find it much easier to chop the spring onion and smoked salmon with scissors rather than a knife. First cook the rice by simmering it in boiling water for 30 minutes or until tender. Drain and set aside to cool. In a small bowl, mix together the ingredients for the dressing. If you find this difficult with a fork, you could use a small, lightweight milk frother. Now add the salmon, cucumber, pepper, spring onion and soy beans to the rice. Add the dressing and give everything good stir until evenly mixed. Top the salad with a good sprinkle of sesames seeds and crumbled nori sheets and serve. As part of National Arthritis Week, Arthritis Research UK are asking everyone living with arthritis to share their experience as part of their 'Share Your Day - Shape Our Future' campaign. By describing the daily pain and challenges you face you can help them shape future research into new treatments. I think it's an incredibly brave campaign. Arthritis is often dismissed as just aches and pains but anyone who suffers from it will know that that pain can be all encompassing and soul-sapping. However, describing the way it affects you can be incredibly difficult. I don't really like to talk about how hard I find living with arthritis. When I've been interviewed about the blog I always say that I don't want to talk about the negative aspects of the illness too much. Partly, it's because I prefer to try to be optimistic - there are worse conditions and I've seen plenty of close friends and family affected by them, and partly, it's because I'm simply not brave enough to describe how it feels. Daily pain is draining. I manage most days with a handful of painkillers and sheer bloody mindedness. The days that I have struggle to play with my daughter, wash my hair or get a spoon in my mouth are the days I want to forget. I'm sure many of you are the same. How many times when the consultant asks how you are have you said 'fine thanks, and you?' before realising that wasn't really the answer needed? The truthful answer, that description of the way the pain colours your day, can be harder to articulate but that's the answer that medical professionals, researchers and policy makers need to help improve the lives of people with arthritis. And, as easy as it is to say ' I'm fine' it's not always the way to spare others feelings. Sometimes friends and family need to hear how your arthritis affects you so they don't take it personally when you say you can't manage something. So, this National Arthritis Week, be a bit brave, if not for yourself then for others, and help Arthritis Research UK by sharing your story. The fourth ever National Arthritis Week is just around the corner. From the 12-18th the various charities, support groups and professional organisations around the UK will all be doing their bit to raise awareness about arthritis. Obviously I'm biased but I think it's a great idea. 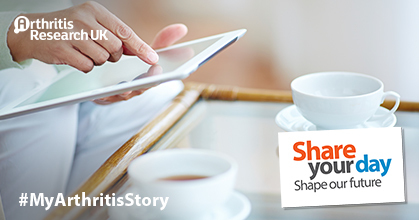 Arthritis affects 1 in 5 people in the UK but remains something of an unglamorous cause. Osteoarthritis is on the increase as life expectancy increases and rates of overweight and obesity rise. The daily pain of living with the condition causes immense suffering yet, too often people are told it is just something they have to put up with or an inevitable part of growing older. Similarly auto-immune arthritis is poorly understood: I still get told I'm too young for it or have I tried emu oil/cutting out peppers/doing yoga. There are some amazing new treatments around now and some exciting breakthroughs being made but auto-immune arthritis can still affect everything you do and not just your joints. When I was pregnant I was actually amazed by how few medical professionals understood the condition or the medications and I often felt like I was having to teach them - which isn't something you particularly want to do when you are a mess of raging hormones! I'll post a bit about all the different awareness raising activity going on but I wanted to start by blogging about Arthritis Care's Time for Tea campaign. They basically want you to get together, have a natter, gobble some cake and raise some money for the work they doing supporting people with arthritis. I remember phoning Arthritis Care's Helpline before I was first diagnosed - I was confused, in pain and slightly at my wit's end. The lovely lady I spoke to gave me some information and basically told me to refuse to leave the GPs until I got referred! Thanks to that advice I got seen by an excellent team and started on proper treatment. So, to show my gratitude, I'm holding my own Time for Tea party and serving these brownies. It's the easiest brownie recipe ever! There is no melting of chocolate, cracking of eggs or beating butter, which makes it a doddle to make even on a flare-day. Simply stir all the ingredients together and bake for an impressive and delicious red velvet brownie. Instead of measuring the milk and oil out in a jug, you can pour weigh them directly into the mixing bowl: 1ml of milk is the same as 1g. I’ve not specified the amount of food colouring as I have found red food dyes differ massively - I suggest you add a few drops and give the mixture a stir and then add more as necessary. You want a good strong red colour as the intensity fades in the oven. 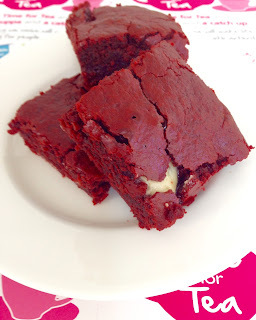 You could also make a raffle prize to raise money for ‘Time for Tea’ by mixing all the dry ingredients for these brownies together in a nice jar. Tie a ribbon around the jar and add a label with instructions to add oil, milk and bake. Put the flour, sugar, salt, cocoa and baking powder in a large mixing bowl. Stir the dry ingredients together a few times and then pour in the oil, milk and food colouring. Give everything a good mix and then finally stir in the chocolate chips. Pout the mixture into a greased 20x20cm baking tin and cook for 25-30 minutes or until the top is shiny and slightly cracked. Remove from the oven and let the brownies cool in the tin for 20 minutes before slicing. Can following the Paleo diet help arthritis? The 'Paleo' diet (short for paleolithic) is in the headlines a lot at the moment but it's not entirely new; there have been various similar diets around since the 1970s with names like the 'caveman' diet (always makes me think of Fred Flintstone) and the stone-age diet. Followers of the Paleo diet believe that we should stick to the diet of our ancestors pre-agriculture so plenty of meat, vegetables and fruit but no grains, legumes or dairy. They argue that the diet of our distant ancestors is the one that we are genetically optimised for. I've lost count of the number of Paleo auto-immune protocols that I have read on the internet purporting to cure arthritis. Usually I try to be fairly open-minded about different dietary approaches but I think a lot of the information available about the Paleo diet is entirely misleading and irresponsible. For a start, the whole premise of the diet is that diseases like rheumatoid arthritis didn't exist in the Paleolithic era because they are diseases of affluence and linked to the consumption of grains, legumes and dairy. However, it is more likely that conditions like arthritis didn't exist simply because life expectancy was so short that acute infections, other humans, accidents or predators got to you before any chronic diseases had the chance to develop. Secondly, there if a lot of mixed evidence on what was actually eaten during the paleolithic period by our ancestors. Hunter gatherers were likely to be a lot more nutritionally flexible than the Paleo diet implies - when you exist hand-to-mouth you eat what is available. Your average cave man wouldn't have had the luxury of turning down available food sources in order to pop to WholeFoods. Equally, our ancestors diet would have evolved and varied over the 3.4 million years of the paleolithic period. It wouldn't have been set in stone (if you will excuse the terrible pun). In fact, recent research suggests that grains may well have been consumed by them. Moreover, if the consumption of grains and dairy is so unhealthy it is unlikely that we would have successfully evolved to consume them in our diets. Humans are endlessly adaptable and a wide range of different dietary patterns are followed successfully by different populations around the world. For people with arthritis, foods like wholegrains, beans and dairy are an extremely important and useful part of the diet. They provide essential nutrients that help mitigate and protect against some of the effects of the disease. Although there is little robust research on the effects of diet on arthritis, most studies that have been conducted have concluded that a vegetarian diet or a Mediterranean diet may be most beneficial and several longitudinal studies have suggested that high consumption of red meat (as on the Paleo diet) may increase a person's risk of rheumatoid arthritis. A Cochrane Review (the gold standard of evidence in health interventions) suggested that any dietary intervention that involves cutting out food groups (like the Paleo diet) should be approached with caution by people with rheumatoid arthritis due to the risk of deficiencies and malnutrition. Having said all that, there are some positive aspects to the Paleo diet. the Paleo diet's insistence that we avoid all processed food and increase our consumption of vegetables and fish is a healthy habit for anyone, including those of us with arthritis. But, if you are looking for a great healthy diet for your arthritis, you don't need to look to the Stone Age to find it! We're very lucky that we live by a bramble strewn park full of blackberries, so for the last few weeks the toddler and I have been picking our afternoon snack and coming home with berry-stained mouths and purple hands. We've picked so many that I've had to begin coming up with alternative uses for all of the blackberries we've scavenged - one of which is this easy crumble. It's barely a recipe - I can put this together even on days when my arthritis is as miserable as the weather and there is nothing quite like tucking into a wholesome, comforting home-cooked crumble. This recipe is healthier than many traditional crumbles. Rapeseed oil replaces butter and keeps things light and crisp. It's high omega 3 content means it is good for your joints too. All dark coloured berries are a wonderful source of anti inflammatory anti-oxidants. The deep pigments that stain your hands and mouth are a phytochemical called anthocyanin. Feel free to use whatever berries you have to hand. Frozen fruit works well too - simply defrost it before cooking and bear in mind that it may take slightly less time in the oven as the frozen fruit breaks down quicker. Preheat your oven to 180C/375F. Place the berries in your baking dish and sprinkle over the sugar, if using. In a small bowl, mix together your porridge oats, nuts, honey, oil and cinnamon until every thing is evenly mixed. Sprinkle this mixture over the berries and then pop the whole dish in the oven. 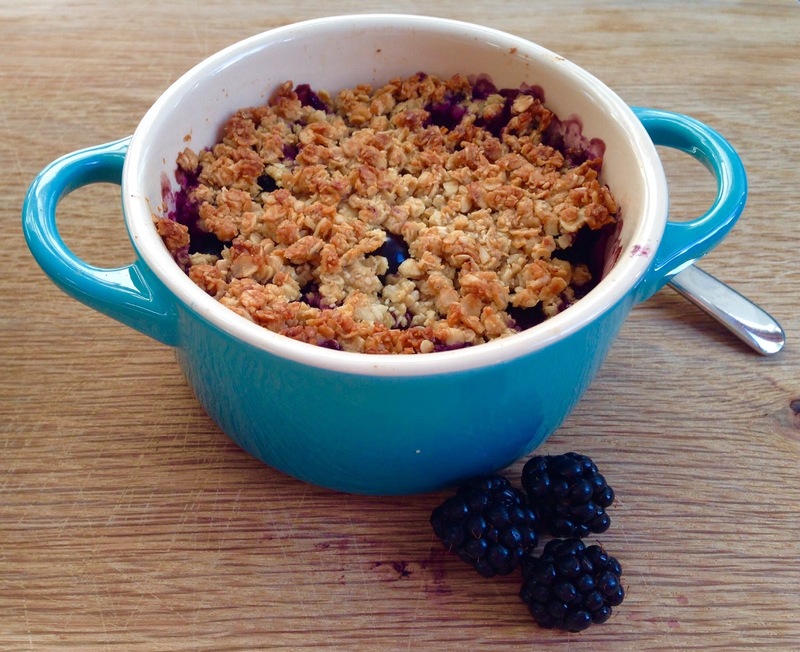 Bake for 30-35 minutes or until the fruit is bubbling and the crumble is golden. I have some shiny new kitchen kit to review today - the Peta UK Easi Grip knife range. If you have not come across Peta before (and not, they aren't that PETA - read their hilarious 'who we're not' page), they are a lovely company who design and make products to make living with a disability easier. I was sent a selection of their knives to review. 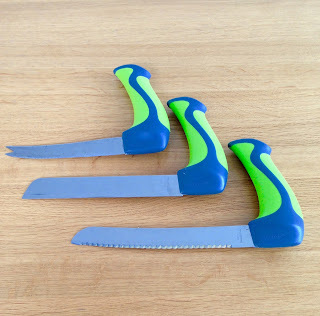 I tested the bread knife, carving knife and all-purpose knife.The knives are designed to make chopping easier in the kitchen. They have wide, non-slip soft grips and an angled handle to help keep the wrist and hand joints in a comfortable position. Yes. I'm really impressed by the knives. The thing I was actually most worried about was how sharp the blades would be. If you have ever been at one of my talks, you will know the first thing I say is 'a safe knife is a sharp knife'; a blunt knife makes it harder to cut and requires more pressure. So many knives I try are just not sharp enough to cut with but all three of these knives worked well. I was especially impressed with how the bread knife cut good slices of a crusty loaf. The grip is comfortable to hold and doesn't add too much weight to the knife. I found it very good for my thumb joints. The knives were also easy to clean. My only caveats would be that if you had very bad elbow arthritis (rather than wrist or finger problems) then you might find the knives trickier to use because the grip requires more of the motion to come from there. Also they are a pain to store because of the large handles, although the company do sell a good magnetic rack for them. Finally, I couldn't actually get into my knives at first because I couldn't remove the plastic blade cover without requesting my husband's help. A small niggle but it did cause me several aggravating minutes of cursing - like my toddler when she wants to get into a cupboard but can't! I was sent the knives free to review but they retail for a reasonable £11.95 each and you can buy them direct from Peta here. There are so many supposedly arthritis-friendly kitchen gadgets on the market but very few that you really do feel have been designed and tested by people with a proper understanding of the challenges of cooking with arthritis. With these knives I really did feel like they were made to help with the frustrations of arthritis - not add to them. These yummy sweet potato muffins are like a cross between a very good sticky toffee pudding and a carrot cake. The dark brown sugar and sweet potato combine to create a lovely gooey caramelly crumb without needing to use as much refined sugar or fat as a regular muffin. I won't lie - grating sweet potato when you have arthritis is not easy. I either get my husband or the food processor to do it! The recipe also uses yoghurt - I actually like them best made with soy yoghurt but you can use any yoghurt except the greek kind (which would make them too dense and fudgy - unless you'd like them like that). You could even use a toffee flavoured yoghurt if you liked but this will add a lot of sugar. Mix the wet ingredients (yoghurt, eggs, oil) together in a jug. Put the flour, ground almonds, sugar and baking powder in a large mixing bowl and stir together. Then pour in the wet ingredients and stir until everything has just come together. The batter will seem a little thick but this is a good thing because the sweet potatoes will release moisture as they cook. Spoon the mixture into a well greased 12 hole muffin tin. Bake for 20 mins at 180C/375F or until they are well-risen and golden. Allow the muffins to cool in the tin for 10 minutes before you attempt to turn them out. Some of you may know the charity, Arthritis Action, which has recently had a fantastic relaunch. The charity is really focussed on helping people learn to manage their condition through healthy diet, exercise and support. I write a monthly column for them and had been down to do a recipe demonstration at their AGM. Sadly, the toddler and I got struck by a horrid chest infection (humira and play groups don't always mix) and I had to miss it. The upshot of that was that I was left with lots of packets of puy lentils from the demonstration I had planned. Once we had them in pilafs, burgers and salads I began to run out of ideas until I decided to make a dip. This puy lentil and walnut hummus is absolutely delicious and incredibly quick to make - which is a good thing as we scoffed it all over one long lunch time. Lentils have a reputation as being a bit worthy and boring but they are a fantastic source of fibre, folate and b vitamins - all of which are really important for people with arthritis and something that studies show we often fail to consume enough of. Walnuts are also great as they are the nut richest in in inflammation fighting omega 3 fatty acids. Put all the ingredients in a blender or food processor and blitz until smooth. If the dip is a little thick, you can add a touch more water. Check the seasoning and add a touch of salt or more vinegar if required. Serve immediately or it will keep in the fridge for up to 2 days. If you have arthritis, the internet is amazing. Yes, certain corners of it are filled with health jumbo jumbo, trolls and scams but it is also the most amazing source of company, support and entertainment when you are stuck home with a flare. 1. How to chop lots of cherry tomatoes quickly - I often make a quick supper of chopped cherry tomatoes, basil, olive oil and pasta but, gosh, how tedious and sometimes painful it is slicing them all up. Turns out you can simply pop all your cherry tomatoes onto one saucer, cover with another and then slice through them with a sharp knife. Here's a video which explains how it's done. I've found it only works with fresh, firm tomatoes and a very sharp knife - otherwise you just get a soggy mess. 2. Ginger doesn't need to be peeled - !!! I've peeled ginger my entire life and it turns out this isn't at all necessary as long as it is fresh and has firm skin. Oh, the hours I've wasted...If your ginger is a bit old and gnarly, instead of a peeler, try using a spoon to scoop off the skin. And, did you know you can cook and eat squash skin? 3. How to peel potatoes without a peeler - I feel much better about peeling potatoes now I have this little gadget but you can also try this method: simply score around the middle of each potato piercing the skin. Boil them as normal and then allow them to cool. Once cool you can just peel off the skin. Or alternatively, boil the potatoes with the skin on and then pop them in an ice bath. You should be able to just rub the skin off afterwards. 4. Avoid having to turn or flip food during cooking - instead of having to get the tray out of the oven halfway through to turn your chicken or chips, simply pre-heat the baking tray first. The blast of heat ensures the underside gets crisped too without getting the tongs out. What are your favourite arthritis kitchen hacks? Using flatbreads or wraps as a base for pizza isn't a new idea, but it's one I hadn't tried until recently. I was always a bit sceptical and was certain that the base would just taste like a hot flatbread rather than a proper crust. I'm glad to say that I was totally wrong - popping a wrap or flatbread onto a hot baking tray crisps it up beautifully, like the best kind of thin and crispy pizza. It's also a great, quick way to make and arthritis-friendly pizza with no kneading or chopping required. You can even use gluten-free wraps if you prefer. Pizza can actually be a healthy dinner when it doesn't arrive on the back of a moped.I top our pizzas with my leftover 5-A-Day vegetable sauce. Cooked tomato sauce is packed with the antioxidant lycopene which may help reduce the risk of cancer and heart disease. Add a little reduced fat cheese for calcium and whatever vegetables you fancy and you have a great nutrient packed supper. Try to use as many colourful vegetables as you can for the widest range of vitamins: I like a rainbow of red onion, artichoke,aubergine, pepper and courgette.If you fine slicing vegetables tricky, a combination of sweetcorn, fine asparagus, olives and rocket leaves makes a nice no-chop variation. If the idea of flatbread pizza still leaves you cold - try my polenta pan pizza recipe. Preheat the oven to 180C and put a baking tray in it to get good and hot. Smear your flatbread with the tomato sauce and sprinkle on the cheese. Top with your choice of vegetables and then transfer the whole thing on to the hot baking sheet. Cook for 8-10 minutes or until the cheese has melted and then serve. Sugar and Arthritis - Should you cut sugar from your diet? diet baddy and that if we can just kick our sweet addiction we'd be slimmer, healthier and happier. There are even frequent articles talking about how pro-inflammatory sugar is and how dangerous it is for those of of us with arthritis. But what's the truth? Will cutting out sugar really help our joints? Most of us have a bit of a 'sweet tooth'- when we have something sweet we want more of it and we all know what happens when we at too much of anything - we get fat. It's this overconsumption of food that leads to the negative effects of sugar on our health such as type 2 diabetes, an increased risk of osteoarthritis and high blood pressure. Sugar itself doesn't directly cause these conditions (although your dentist was right - it does rot your teeth) but contributes to the risk of being overweight and all the pro-inflammatory biochemical changes that come with that extra weight. But before you crack open that bottle of syrup, it's worth remembering that not all sugars are equal. If you are trying to eat a healthy diet to help manage your arthritis or your weight then you want all the energy you consume to count - everything you eat, as far as possible, should be bringing some added nutritional benefit alongside the calories. 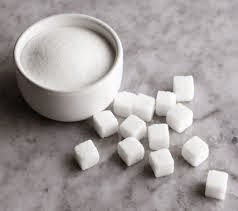 For example, a tablespoon of castor sugar is about 50 calories and so is an apple - they are both sweet but the apple also contains antioxidant vitamins and fibre. If you aim to follow the UK NHS advice and consume no more than around 53g sugar a day on a 2000kcal diet then the best way to make every gram of that sugar arthritis-friendly is to focus on avoiding added or extrinsic sugars - basically all sugar not contained within a food naturally (fruit juices or purees count as extrinsic sugars because in whizzing up the fruit the sugar has been released from the cell walls and no longer comes with a side helping of all the fibre from the fruit). As usual balance is key - whilst on one hand managing arthritis might be more straightforward if cutting out sugar was that magic answer, I for one am quite glad that just occasionally, when I'm having a flare and it's all to much, I can prise the top of the biscuit tin with my dodgy hands and enjoy a little sweet treat. If you want to read more about sugar and health, check out this lovely explanation from the Science Media Centre. I don't personally eat a gluten-free diet for my arthritis as I've not noticed any relationship between eating gluten and flares but I know that many of you do (you can read more about the pros and cons of going gluten-free here) so I've been experimenting with different grains recently. Whilst I've happily tucked into millet, amaranth, quinoa and even teff over the last few years, until I made this salad I had never cooked buckwheat (or sarasin). Buckwheat is a bit of a misnomer because it isn't actually a relation of wheat family at all - buckwheat is a seed belonging to the rhubarb family. It has a lovely earthy, slightly sweet taste and is easy to make into pilafs, porridge or risottos. You can also make lovely Breton style crepes, bread or blinis with the flour. Buckwheat is a rich source of the phytochemical ruin which has been shown to help strengthen blood vessels and potentially help circulation. There have been a few rat (!) studies which have shown that rutin helped decrease inflammation in animals with rheumatoid arthritis but these findings haven't been replicated in humans. Try this salad cold the next day as a tasty lunchbox meal or top it with crispy baked cannellini or butter beans for a filling meal. Peel the onions and cut them into quarters. Place in a roasting tray with the squash and whole garlic cloves. Drizzle the oil over everything and stir to ensure everything is evenly coated. Pop in the oven and bake for 35-45 minutes or until the squash is golden and the onion soft. Set to one side to cool. Rinse the buckwheat and put in a saucepan with the stock. Bring up to a low simmer and cook for 15 minutes until the buckwheat is soft and most of the fluid has been absorbed. Drain off any excess water. Put the cooked buckwheat in a serving dish and top with the butternut squash and onions. Squeeze the roasted garlic cloves out of their skins and add along with the herbs and balsamic vinegar to taste. Give everything a quick toss and then garnish with the baby kale. Baked vegetable crisps - these are so easy if you have a mandolin and a microwave although you could also just slice the vegetables finely and bake them on a low heat in the oven. Try sweet potatoes for a boost of vitamin A or even phytochemical packed beetroot slices. Both are a more arthritis-friendly snack than a packet of Walkers ready salted! Roasted chickpea snack - this works well with other beans too. My toddler can't get enough of cannellini beans cooked this way. Dips and chips - my favourite current dip is the carrot hummus from the Hugh Fearnley-Whittingstall Veg book but I also like this wasabi dip, my healthy hummus or a simple carrot and coriander dip. Serve with raw vegetable sticks (sugar snap peas of baby corn are a great no-chop option) or roasted sweet potato wedges. 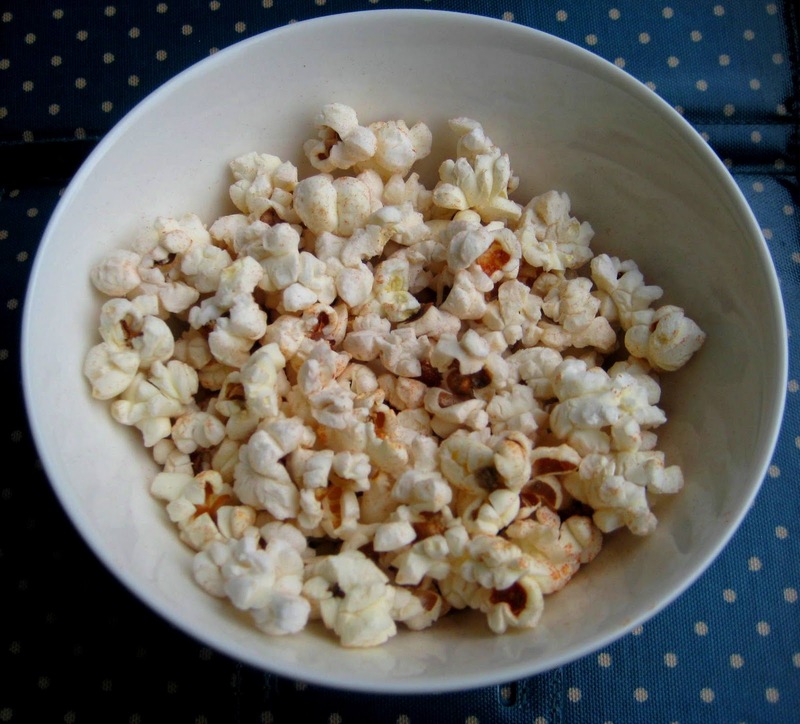 Homemade popcorn - actually very cheap and easy to make. If you find heavy saucepans difficult to lift with your arthritis then have a look at this easy microwave method. What's your favourite arthritis-friendly snack? The Chef'n Palm peeler is a vegetable peeler that you wear like a ring! It fits in the palm of your hand so you don't need to grip it to peel carrots, potatoes etc. It is very easy and straightforward to use. I slide mine over my middle finger and can use it to comfortably peel vegetables, although if your finger joints are very swollen it could be a tight fit.The palm peeler is made of slightly rubberised plastic so feels comfortable and doesn't slip around. The actual peeler blade is good and sharp which means it glides through most peel without needing too much pressure. I find it much easier to use than an ordinary vegetable peeler because it removes all the stress from your thumb joints. The only downside is that you do need to use your wrist more to direct the peeler. It's easy to clean - I've thrown it in the dishwasher and the Chef'n palm peeler has come to no harm. A I wish I'd found one sooner! You can by the Chef'n peeler online here. What to cook when you don't want to cook! 1. Thunder and lightning pasta - I *think* that this is a genuine Italian dish but regardless it makes and amazingly quick arthritis friendly supper and you probably have all the ingredients in your store cupboard. Simply cook and drain some pasta and then toss with cooked chickpeas (from a can), olive oil and garlic. 2. Baked sweet potato - packed full of goodness and on the table in 5 minutes if you have a microwave. You can read my suggested topping ideas here. 3. Pitta pizza - a wholemeal pizza smeared with tomato paste, sliced light mozzarella and topped with bits of torn pepper and basil. You can get this on the table faster than you can call for pizza delivery! If you have any jars of marinated peppers or artichokes then use these for the topping and it will be even tastier. 4. Steamed fish and rice - pop fish and vegetables like mangetout, sugarsnaps or green beans in a steaming basket over a pan of rice whilst it cooks. Try placing slices of ginger and spring onion on the fish and cooking the rice with a spoonful of coconut milk. 5. Pasta with raw tomato sauce - so quick, easy and healthy.It's a good recipe if people are coming over as it seems like a proper dinner but takes no longer to prepare than the time it takes the pasta to cook. Find the recipe here. Those are my top five arthritis-friendly suppers - what are yours? Red meat is always a bit of a controversial topic when people discuss diet and arthritis. Red meats, like beef or lamb, have been linked to higher rates of incidence of rheumatoid arthritis, perhaps because red meat tends to be high in pro-inflammatory omega 6 fat, arachidonic acid. Red meat is also a source of saturated fat (which is sooo controversial at the moment that I'm not going to delve into it here otherwise we'll never get onto the recipe - and that would be a shame). Either way all that fat means it can be higher in calories than lean white meats which is worth bearing in mind if you struggle to maintain a healthy weight. However, having said all that, red meat is also a wonderful source of iron. People with inflammatory arthritis can often suffer from anaemia and couple of portions of lean red meat a week can help boost your iron intake. So should you eat red meat if you have arthritis? My advice is, if you like red meat, then enjoy lean cuts of it a few times a week and don't worry.This tasty meatloaf recipe is an easy way to prepare it and you can make it in advance and freeze it for days when your arthritis is flaring. I've used a food processor to make it really quick but you could also chop the ingredients by hand and make it in a bowl. Peel the onion and halve it. Put it in the food processor with the clove of garlic and pulse until they are finely chopped. Add the bread, egg, tomato puree and paprika and pulse again to combine everything. Top the mixture out into a bowl and add the mince. Give everything a good stir. Spoon the mixture into a well greased 2lb/large loaf tin and bake for 45-50 minutes or until browned on top and cooked through. Let it cool in the tin for 15 minutes before turning out and slicing. Moroccan - add a tsp of ground cumin and coriander to the mixture with some dried chopped apricots and lemon zest. I don't normally review non-kitchen related arthritis things on 'Cooking with Arthur' but over the past year I've been approached various times and through various agencies about Flexiseq - a pain-relieving gel for osteoarthritis. After a bit of umming and ahhing, I recently decided I would give it a go. Having my daughter has been tough on my joints. Lifting 10kg of exuberant toddler 30x plus a day it hard work and whilst my PA is relatively well controlled by the Humira, old mechanical problems like the OA in my back and shoulders have fared less well. I get by with physio and handfuls of painkillers but it's not always enough and I felt open to trying something different. The idea behind Flexiseq is a simple one; if you imagine that osteoarthritis makes you feel like the tin-man, well, Flexiseq is supposed to act like the oil can. The 'sequessome' technology is claimed to deliver phospholipids right to the joint to lubricate it and relieve pain. Having worked in health and medicines policy, I'm inherently sceptical about anything that makes claims to help arthritis but Flexiseq has pleasantly surprised me. Morning and evening you spread a fairly large amount of the gel onto the soft tissues around the affected joint and let it dry (this takes 10 minutes). The gel has very little scent and is actually quite cooling and pleasant to use (certainly compared to an ibruprofen or diclofenac gel). My first experience with the gel was applying to to my back: I have OA in my spine and was keen to see if it could make much of a difference. Back pain is notoriously difficult to treat and I'm afraid Flexiseq didn't do much better than any other non-prescription treatments I have tried. I gave the gel a go on my shoulder instead however and found it did seem to help with that. The joint felt more comfortable and less stiff. The effect wasn't enough to stop me taking painkillers but it certainly helped on very difficult days. Finally, I let a friend with OA in the base of her thumbs and index fingers try the gel and she found it really helpful on mornings when her hands were stiff. She noted that the gel seemed to work from the first go but that she didn't feel like it got more or less effective over the course of 5 days testing. I think our differing results probably reflect on our suitability as users. I have an underlying autoimmune condition (the psoriatic arthritis) and therefore have widespread inflammation as well as little bonus pockets of OA. I'm used to taking pretty strong painkillers and am physically quite tough on my body (pushing a 25kg buggy up hills whilst singing nursery rhymes for example). For people like me, I think Flexiseq is probably of marginal benefit. However, for people like my friend with a discrete and well defined number of affected joints, then Flexiseq may well be a real help. I know both myself and my friend liked the fact that we didn't have to worry about it interacting with medications and it doesn't cause the heartburn of most inflammatory drugs. You can buy Flexiseq in most chemists or online. If you'd like more information about it and the research conducted on it's effectiveness to date then visit Arthritis Research or the Flexiseq website. 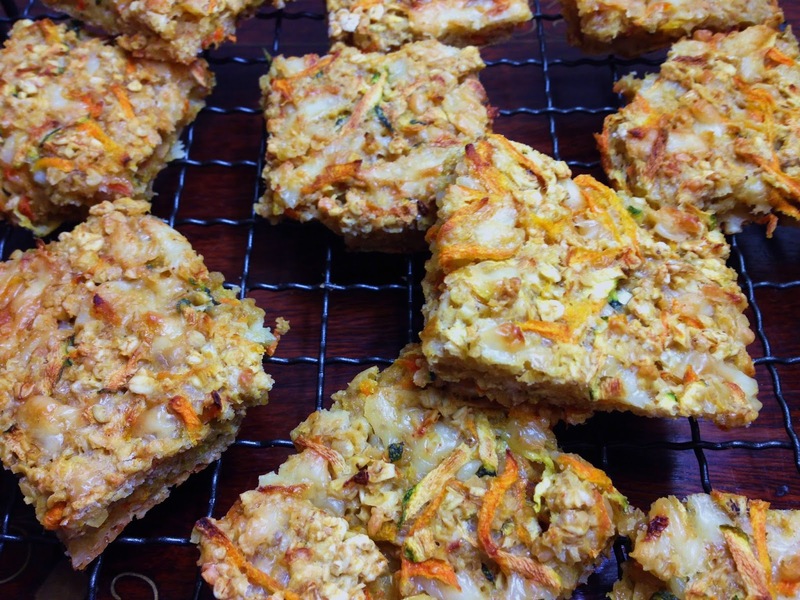 Savoury flapjack?! Before you click on with a shake of your head and wonder whether my arthritis has somehow gone to my brain, let me tell you how delicious these are. I came across them on the wonderful Riverford Organics website (which is full of some great recipes) when looking for a good portable savoury snack for my cheese-monster of a daughter. I've adapted Cath Critchley's recipe slightly to add courgette, a bit more egg to make them less crumbly (for little hands) and a mild kick of paprika. If your arthritis affects your hands then you might prefer to buy ready grated cheese, as I do. I'd usually use a food processor to grate carrots but as it's such a small amount in this recipe a good sharp microplane grater makes it fairly easy. Beat the eggs together in a small bowl with the garlic and paprika. In a large bowl, combine the oats, cheese, and grated vegetables. Add in the beaten eggs and mix everything together until it seems evenly distributed. Spoon the mixture into a 20cm square tin and press down firmly with the back of a fork. Bake for 30-35 minutes or until golden brown. Remove from the oven and cut into 16 squares and then immediately turn out onto a wire rack to cool - this keeps them crumbly and crisp, rather than getting soggy bottoms! These will keep in a tin in an airtight tin somewhere cool for 2-3 days or you can freeze them and warm them up in the oven as needed. These are a much healthier snack than the sweet kind of flapjack and will keep you going much longer thanks to their low sugar content and boost of fibre from the oats and vegetables. Although the cheese is high in salt and saturated fat, it also provides calcium and protein. The eggs provide a bit more protein along with vitamins A, D and the B group. If you have been on some kind of arthritis diet this New Year then chances are you have cooked, eaten or wondered about quinoa. Quinoa (pronounced keen-wa) is a small seed that is cooked and served like rice or couscous. It is gluten free with a nutty, mild flavour and is unusual in that it is a complete plant protein source, containing all 9 amino acids. It’s quite widely available in supermarkets and health food stores nowadays. I find the flavour best if it’s lightly toasted first in the pan before you add any fluid. If you struggle to find it or want a substitute, this recipe will also work well with brown rice but you will need to adjust the cooking times accordingly. Rinse the quinoa well and then put it in a saucepan. Cover with the chicken stock and bring up to the boil. Simmer the quinoa for around 15 minutes or until the edge of the seed begins to come away from the germ - it will look like little white squiggles! Drain the quinoa well and set to one side. Heat the oil in a pan and then add the garlic, carrot, kale, turmeric and cranberries. Stir-fry for 3-5 minutes - just long enough to soften the vegetables. Tip in the quinoa and mix everything together. Serve hot or eat as a cold salad. 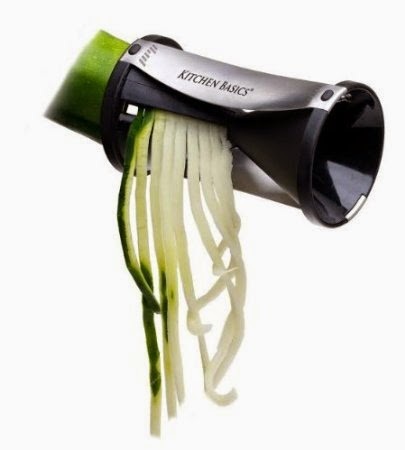 So, in my Christmas stocking was an interesting new arthritis kitchen gadget - a vegetable spiralizer (pictured). I've been playing with it over the holidays and also have had the chance to test a freestanding model (like this) and I thought I'd do a quick review and comparison of the models available for those of you wondering whether they could ever be and arthritis friendly kitchen tool. If you read many healthy eating blogs etc you may well of heard of a spiralizer before but for those of you reading this going 'What?! ', a spiralizer is basically a gadget that turns vegetables into long spaghetti or noodle like spirals. The vegetable spirals can be used as an alternative to pasta or can be added to salads, noodle dishes etc. In my household they are most popular with my 10 month old who loves dangling courgette ribbons from her high chair! I find that the handheld model could only really cope with courgettes. It tended to break up the carrot spirals. The larger freestanding model (in this case the Lurch Spirali) was much better at spiralising (is that a verb?!) carrots, potatoes, aubergine etc. Both were very easy to clean and dishwasher friendly but the blades are very sharp so you have to be a little cautious when dismantling them. How easy is it to use with arthritis? A freestanding spiralizer is much much easier to use with arthritis. You need to apply some pressure to the vegetable using a small lever and then crank a handle but both are relatively comfortable to use for a short time. I found harder vegetables, like carrots, a bit tricky with the Lurch Spirali as it was the lever does get a bit stiff and hard to grip with sore hands or wrists. The handheld sprializer is useless if you find it hard to grip or twist with your wrists. I find it ok to do a small amount of courgettes but wouldn't want to use it for too long. The freestanding spiraliser is more expensive and takes up more space but is probably a better bet if you have arthritis and think you might spiralize regularly.